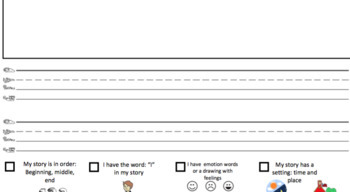 This lined paper can help students apply their fundation writing skills and also have a small checklist to help them remember what a personal narrative is suppose to have. I aligned this to my knowledge of TC writing a personal Narrative. Students are reminded to have a beginning, middle, end, the word "I", emotions either in their pictures or using words and having a setting: time and place. I hope this tool helps! :) You can teach each component as a mini lesson and show students how to use the writing paper.